The NFPA Certified Electrical Safety Compliance Professional (CESCP) certification program is designed to meet the needs of electrical and safety professionals who oversee electrical safety programs or who manage electricians and other personnel exposed to electrical hazards. The CESCP certification showcases an individual’s knowledge and proficiency with the practices and concepts found in NFPA 70E, Standard for Electrical Safety in the Workplace. The CESCP certification program consists of a set of eligibility requirements (completed prior to program application), a computer-based examination (with a retest process in the event that you do not pass the exam), and a set of re-certification requirements (based on a points system) that must be completed within a three-year time period following the initial certification. Watch a brief interview with CESCP certification holder, Terrance McKinch. The CESCP certification exam is a three hour, open-book, multiple-choice exam taken at an approved, computer-based testing center. The exam is based on the 2018 Edition of NFPA 70E, Standard for Electrical Safety in the Workplace. To locate a computer based testing center near you, visit the test center website. Per NFPA 70E Section 110.2(A)(1), designation as a Qualified Person involves factors such as training on equipment and work methods that can be specific to a work site, job function, or employer. Therefore, earning the CESCP credential alone does not make the certificant a Qualified Person. It is the responsibility of an employer or governmental agency having jurisdiction to outline the specific requirements necessary to become a Qualified Person for any given job or site. Employers and others may include this certification as one part of the requirements to become a Qualified Person. 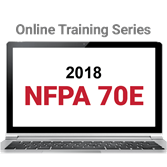 Register for the 2018 NFPA 70E® Online Training Series to learn latest strategies to reduce electric shock and arc flash risks. 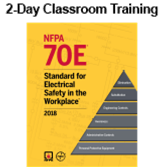 Learn how to assess risks and protect personnel against shock and arc flash hazards using the 2018 NFPA 70E. Then, earn your Certificate of Educational Achievement online!